First and foremost, while I'm sure Toy Story 4 will feature plenty of new characters that can be sold as toys and plenty of new incarnations of old characters that can be re-packaged for sale in support of this fourth film, there is a strange kind of respect for making your new, seemingly co-lead character a spork with googly eyes and pipe cleaner arms that parents of pre-schoolers can bring home on the daily. Disney, Pixar, and the Toy Story brand are each worth more money than I can comprehend and it would seem that to reach such heights would only garner more greed and more ways to try and increase said wealth and stability, but then they go and make what feels like a purely financial move in green-lighting a fourth Toy Story movie after the third film rounded the trilogy out so perfectly all the more pure by placing at the center of it a toy any young boy or girl regardless of economical status can make for themselves. It's surely a calculated corporate move in some regard, I have no doubts, but it's also kind of *nice*. Still, it's easy to admit that when that final reel of 2010's Toy Story 3 finished rolling it seemed there was no better or more poignant way to complete this trilogy that had begun some fifteen years earlier, spanned my childhood, and revolutionized animation as we knew it. Over the nearly twenty-five years now that Pixar has been in power they have become increasingly more reliant on sequels to the films that originally made them that powerhouse. No matter how much I wished for Pixar to keep that book closed though, it was always something of an inevitability that we'd get another chapter in the Woody and Buzz saga. In this fourth chapter a new toy called "Forky" joins Woody and the gang on a road trip that reveals how big the world can really be for a toy. Pixar vet Josh Cooley makes his feature directorial debut from a screenplay by Stephany Folsom and Will McCormack (Celeste & Jesse Forever). 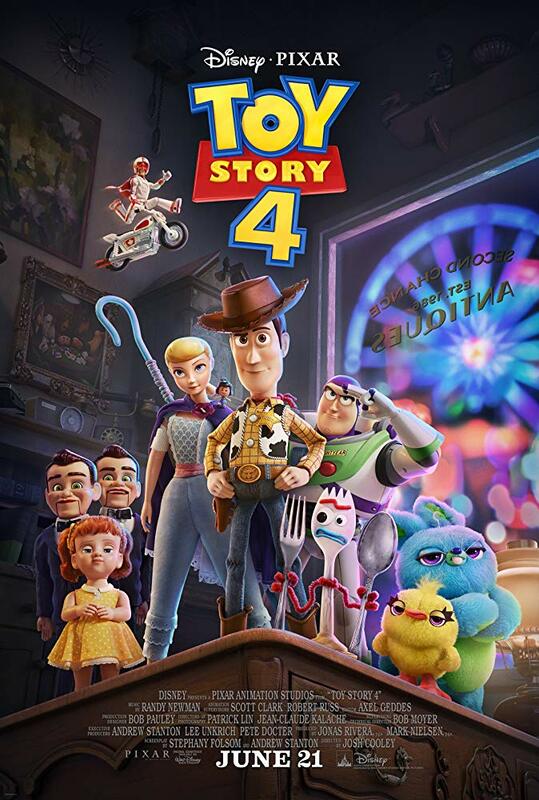 Toy Story 4 features the voices of Tom Hanks, Tim Allen, Jordan Peele, Keegan-Michael Key, Keanu Reeves, Patricia Arquette, Joan Cusack, Annie Potts, Wallace Shawn, Laurie Metcalf, Timothy Dalton, Kristen Schaal, Bonnie Hunt, Jodie Benson, John Ratzenberger, Tony Hale, Blake Clark, and opens on June 21st, 2019.